In today’s world, home improvement doesn’t refer just to a stylish and modern interior and well landscaped garden. Home improvement is also about creating attractive driveways, patios and pool decks. For many homeowners, the exterior of their home is equally important and they look to create a unique and beautiful home and landscape. One of the first things that might impress a visitor to your home is the quality of the driveway; a plain driveway typically does not add to the curb appeal of any home. 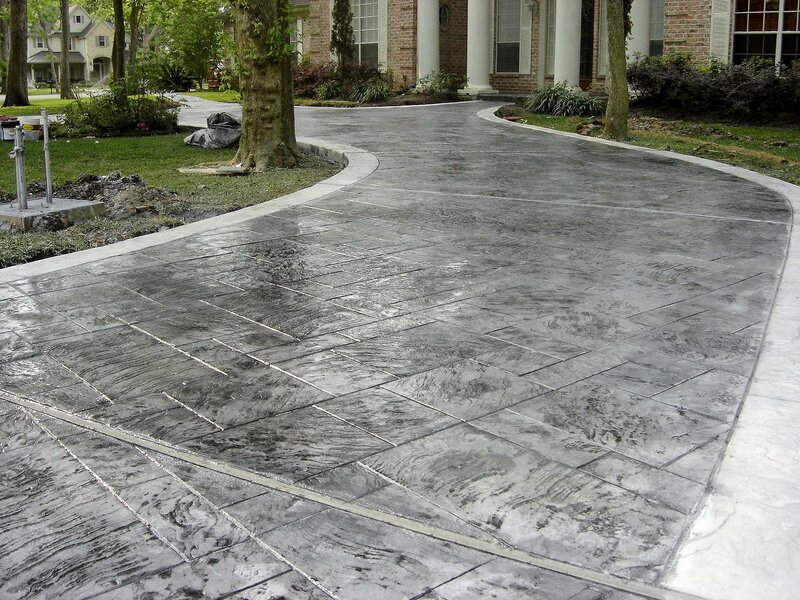 A decorative concrete driveway, on the other hand, can be a great, eye-catching introduction to your home. Most homeowners realize that the quality of a driveway can have a great impact on the appearance and market value of their property. There is an incredible range of paving techniques available today, so it is now quite possible to design a sensational look for the front of a home. In the past, driveway construction materials were confined to plain bricks and stone. Today, concrete and asphalt are the construction materials of choice, with concrete being the most favored because it offers a range of style and color options. Adding in a professionally installed decorative concrete driveway is a great way to instantly update and renew the outside appearance of any home. Decorative concrete comes with many benefits. It is highly adaptable and can be used on just about any shaped drive or pathway. Due to the versatility of this material, the design can be adapted to match the surrounding area. Decorative concrete comes in a variety of colors, textures and patterns. Natural pavers, such as cobblestones and brick, are also popular. A poured driveway is durable, easy to maintain and for colder climates, it is easy to clear of snow. Colored concrete – With this option, color is added to ready-mix concrete to provide tinting throughout the slab. Since the pigment may fade over time, it’s important to apply a sealer to protect the driveway from weather, water and stains. Concrete pavers – These are interlocking pieces of pigmented concrete made to look like clay brick. Using a color sealant will protect the driveway against color fading. Stamped concrete – This option involves making imprints in wet concrete to create the outline and texture of brick, cobblestone, or other natural paving. Concrete scoring – With concrete scoring, shallow cuts are made in the concrete to give it the appearance of tile grout lines, or to create geometric designs and patterns. Exposed aggregate – Exposed aggregate involves pouring concrete then brushing or washing off the top layer of cement. This method exposes a rugged, non-slip surface. Various colors can be obtained based on the landscaping look that you want to achieve. If you choose an exposed aggregate concrete driveway, keep in mind that a sealer should be applied. Chemical staining – Chemical staining is a popular design trend seen on the floors of restaurants and stores, as well as on driveways and patios. Chemical staining involves special stains that react chemically with the lime to etch and bond color into the surface. This process can be used on new or existing concrete surfaces. Today’s homeowners are seeking more creative and decorative ways to pave their driveways. Dressing up your driveway with any one of the colorful concrete paving options will enhance the look of your entire home. If you are considering installing a decorative concrete driveway, or if it is time to renovate your current driveway, you will want to find a professional and experienced team to handle this major home improvement project. Allied Siding and Windows design and production crews can assist with the construction of a variety of concrete projects, including driveways, concrete patios, sidewalks, and parking lots. Using only high quality products in conjunction with their stringent construction and production practices, Allied Siding and Windows gives an optimum level of performance, results, and satisfaction for each customer they serve. Call Allied Siding and Windows today for additional information.